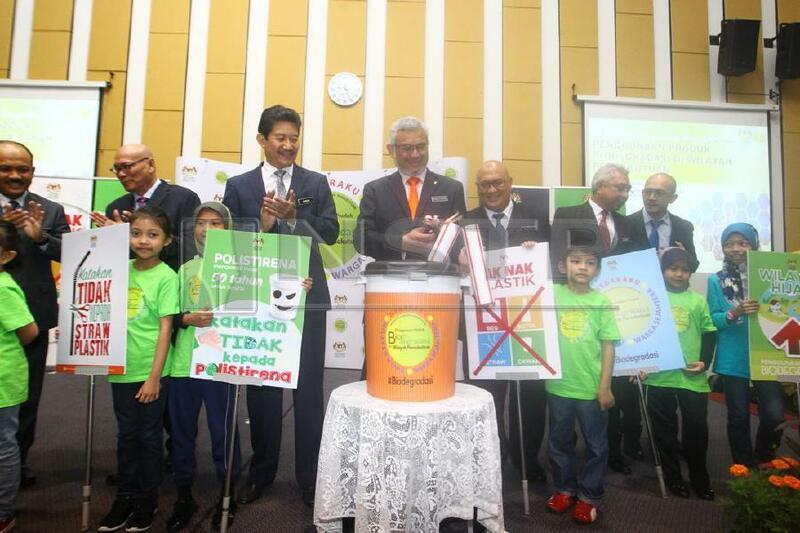 KL, Putrajaya, Labuan to continue using biodegradable, compostable products. KUALA LUMPUR: In a move to preserve the environment from the use of conventional and polystyrene plastic, industrial players in the Federal Territories will be required to use genuine biodegradable products in their transactions. The greenlight on the matter was received following the cabinet decision on July 16, 2018 which agreed that the use of biodegradable and compostable products would be continued and enforced in the Federal Territories of Kuala Lumpur, Putrajaya and Labuan, since it was introduced on 1 June 2016. Federal Territories Minister Khalid Abd Samad said his ministry was committed in curbing the use of plastic and polystyrene through the Federal Territories Green Technology Action Plan which focuses on the implementation of biodegradation products across the three Federal Territories. "I hope that by 2020, the people in the Federal Territories are prepared to use full biodegradable products and would refuse the use of normal plastic bags and straws. "The use of polystyrene containers and plastic straws not only causes pollution but also produces chemicals that threaten human health and are associated with many diseases, especially cancer," he said. Khalid was speaking at the Seminar on Coordination and Enforcement of Biodegradable Products in the Federal Territory, here, today. The seminar was attended by more than 300 participants comprising owners of shopping mall premises, manufacturers, hawkers' associations and small traders. Also present was Federal Territories Ministry Secretary-General Datuk Seri Adnan Md Ikhsan; Kuala Lumpur Mayor, Datuk Nor Hisham Ahmad Dahlan and Putrajaya Corporation (PPj) president, Datuk Dr Aminuddin Hassim. According to Khalid, a handful of shopping centers were had been found to allow their tenants to use plastic products which had not received SIRIM certification. "They were also found to be using prohibited plastic oxo and photo-biodegradable products as well as violating the conditions set by the license. "Legal action will be taken against manufacturers and distributors who abuse the logo of the Federal Territories Ministry on ordinary plastic products, oxo and photo-biodegradable," he said.